The King of Pentacles is the final card in the suit of Pentacles. 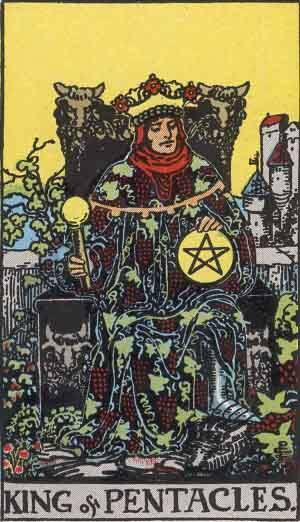 The King of Pentacles embodies much of the meaning of the entire suit, and should be taken seriously when seen. Much like the Queen of Pentacles, The King can represent a strong male influence in your life; likely somebody who is well off in a material sense. The King of Pentacles represents abundance, maturity, authority and success. Past – The King of Pentacles in the Past position can represent a past event where you were cautious and forward thinking. It could have been a time when you didn’t rush into something but stayed back for a while and considered all options. You may have been extremely mature for your age and help more responsibility than average. Present – The King of Pentacles in the present position can mean you’re going to have to look to someone in your life for advice. A ‘father-figure’ is the obvious port of call here, and you should take what they say seriously, even if they haven’t followed what they believe in. They may have the best advice, but just because they haven’t followed it doesn’t make them any less right. It can also represent you. Do not keep your wisdom to yourself, but be there to answer questions for those seeking help. Future – The King of Pentacles in the future position can suggest a strong potential outcome, a life you are happy with if you’re willing to work for it. It isn’t about earning money, it’s about reaching your potential. You have to give it your all, through a mixture of passion, applied talent and effort. If you have a goal in mind, you must start today. Expect good things if you are looking to start a business. Work / Education – The King of Pentacles in regards to work or education can mean you’ll need to look to someone more experienced and learn from them. You might be able to do their job better, but you still need that foundation of background knowledge to be able to work effectively. If you’re studying, talk to your professor or lecturer in your free time. Contacts and links like that can help in many ways in the future. Consider starting your own company, as you very likely have the skills and drive to see it through to success. Romance – The King of Pentacles in romance is a very good sign, and an especially good sign when it comes to finding love. If you’re available and looking, expect to find somebody who you’ll fall head over heels for. They’ll just seem ‘right’ for you. All in all, The King of Pentacles is a great sign for finding love. Expect a new level of maturity in any existing relationships, as a King, expect your other half to become a ‘Queen‘. It might be the right time to treat your partner to a gift or treat, even if there is no occasion. Friends – The King of Pentacles in regards to friendship means things are going well. It might be a good time to make some older friends, or join a club more suited for older people. Even a fraternity such as the Freemasons, or similar, might be what you need right now. Working towards a common goal helps build trust and confidence in each other. The King of Pentacles could represent you, or somebody in your friend group who has attained a lot of material wealth. Try not to let this cause friction in your group. If someone has gained a lot recently, let them act as a mentor to others. Give them the spotlight. Money – The King of Pentacles in regards to finances is another good sign. Are you looking for work or have things taken a bad turn? The King of Pentacles is a good sign, even more so if you’ve been putting your own money and time into a project. A King leads, so you should use your money with your own initiative. Make sound investments and purchases; things which will last a long time and pay off later. Don’t rush into anything, but consider turning that idea into a long term, money making project. Health – The King of Pentacles echoes the mature nature of the card when health is concerned. It’s a case of knowing what is right for your body and mind, and then doing those things. You know how to eat well, you know how to exercise, you know what to avoid. It’s just a case of putting these things into practice. A role model will be a good thing to have right now. think of someone living your perfect life, and aim for it. Spirituality and Mentality – The King of Pentacles in spirituality can be mixed when spirituality is concerned. Sometimes, ‘mature’ people will scoff at the thought of religion and esotericism. You need to keep an open mind. We can’t explain everything, but that doesn’t mean we need to leap to conclusions. Certain aspects of our lives may confuse us, but looking at the evidence, we know the right path to take. Financial issues and an obsession with wealth can come to light when the the King of Pentacles is reversed. Instead of a benevolent and generous king, a tyrant is presented. In reverse, the King of Pentacles embodies these negative aspects. Firstly, these may be representing you. Are you currently obsessed with wealth and money? These aren’t attractive or healthy traits and you should work out why others are perceiving you this way. Being careful with money is one thing, but don’t take it to the extreme. A little thing like buying drinks for friends or a little gift can go a long way in both furthering your relationships and making yourself feel good by helping others. We’ve selected live tarot readers to give you a FREE 3 Minute interpretation of The King of Pentacles! Scroll through them below and pick your favorite one.